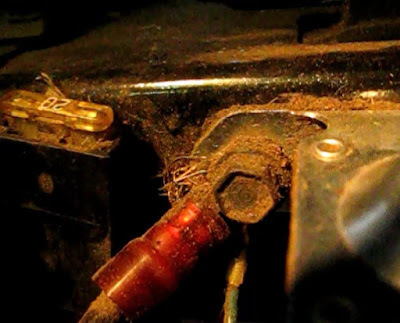 If a lawn tractor fails to start, with a known good battery and starter, the next place to look is at the starter solenoid. This is the control part between the battery and starter. In this post I will show how to locate, troubleshoot and replace the starter solenoid in an MTD lawn tractor. The procedure would be similar in other brands of tractor, such as Cub Cadet, John Deere and Toro. Shown is MTD model 13AL667F118. This post assumes no voltage is present at the starter. We will backtrack to the solenoid and do some troubleshooting. 1) Remove the knobs from the gear stick and speed selector. They simply rotate off in a counterclockwise direction. 2) Remove the two philips head sheet metal screws which fasten down the console cover. 3) Pull the cover out over the now knob-less levers. 4) Optional: Unplug the wire attached to the cover. Then it can be set out of the way. There is the solenoid mounted under the front of the seat. The solenoid consists of a coil of wire that is energized when safety requirements are met and the ignition is turned into the start position. When the coil is energized a contact closes and the battery voltage passes over to the starter. We must establish first that the all important starter control signal is getting to the solenoid. 1) Attach the positive lead of a voltmeter, or test lamp, to the control terminal. This is a spade connection on this solenoid. Clip a lead on the spade and put the ground on the battery negative or on one of the mounting bolts of the solenoid. 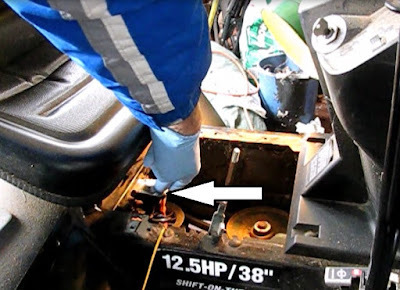 Now turn the ignition to start and look for the 12V at the spade connection. If this is present proceed to the next step. If not, the control circuit will need to be examined for the fault. 3) Confirm battery voltage at the incoming battery connection of the solenoid. If voltage is present proceed to the next step. If not look for a loose or corroded battery connection. 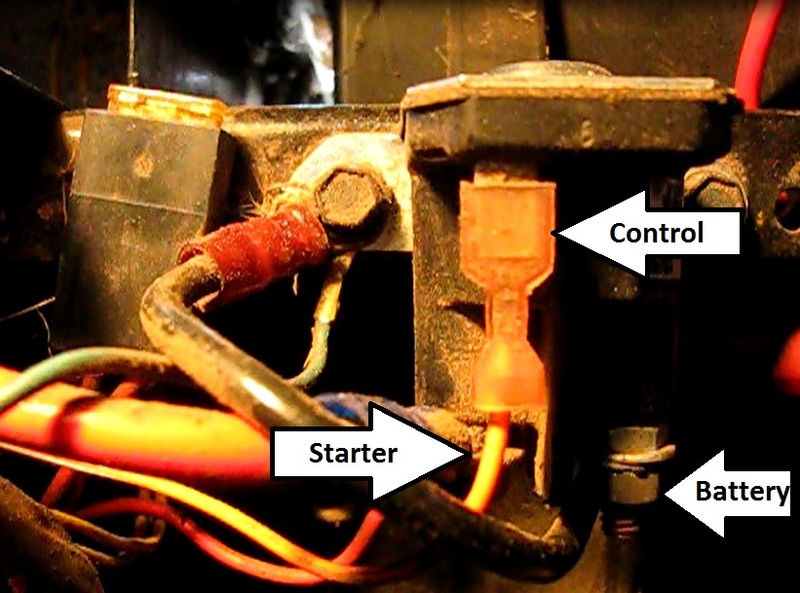 4) Place your meter or light at the output of the solenoid (right side). Turn the ignition switch and look for 12V here. If not present, replace the solenoid. If present, check for it at the starter. There could be a broken or loose connection at the starter. 1) Disconnect the negative of the battery. 2) Unwire the battery with a 7/16 (or 11mm) connection from the large left side terminal of the solenoid. There are two wires that connect here. 3) Disconnect the control wire from the spade connection. 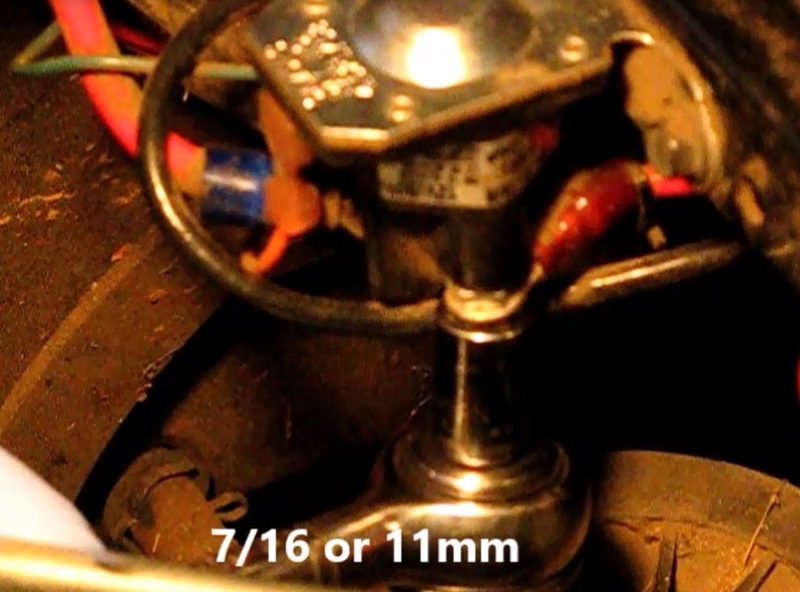 4) Unbolt the output wire from the solenoid. 5) Unbolt the two solenoid.mounting bolts to the bulkhead. These are 3/8". There is an additional small ground wire on the right side. This solenoid is not a difficult part to find. 1) Wire up the incoming side. There are two wires here. Turn the 7/16 nut finger tight. 2) Wire the output side. 3) Plug in the control wire to the spade connection. 4) Mount the solenoid to the tractor bulkhead with the 3/8" bolts. Remember there is an additional ground wire on the right side. 1) Plug the wire into the underside of the console cover. 2) Place the cover into position over the two posts. Vehicle starting problems are quite common especially in winters, we are facing multiple types of starting problems. This concept is applicable in both cars and lawn tractors. As a vehicle owner, I must say starting problems the most frustrating issues of our vehicles and to deal with these issues, we need to take the help of experts. Here from this article, we learn how to deal with the starting problems of our lawn tractor and most probably in cars also, we need this kind of manual. Just like vehicles, there ar each gas and electrically power-driven riding field mowers. If you buy an electrical lawn tool, you usually ought to confirm that the battery is totally charged before exploitation. electrical mowers also are quieter and a lot of environmentally friendly. if you want to read more about ride on mower then please visit our website.